Staff was very helpful. Couldn't have asked for better service. It was my first trip to Santorini. If or when I go back I will stay at the same place. I travel quite a bit and don't hesitate to give this place a real thumbs up! Excellent location and the most friedliest staff of our whole vacation! Would recommend Marizan to everyone! Staff were excellent. They will go above and beyond to cater to your needs. Great service! Super friendly staff. 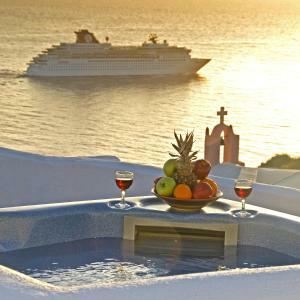 The best views and location in Oia. This was nothing less than the location of my dreams in Santorini. 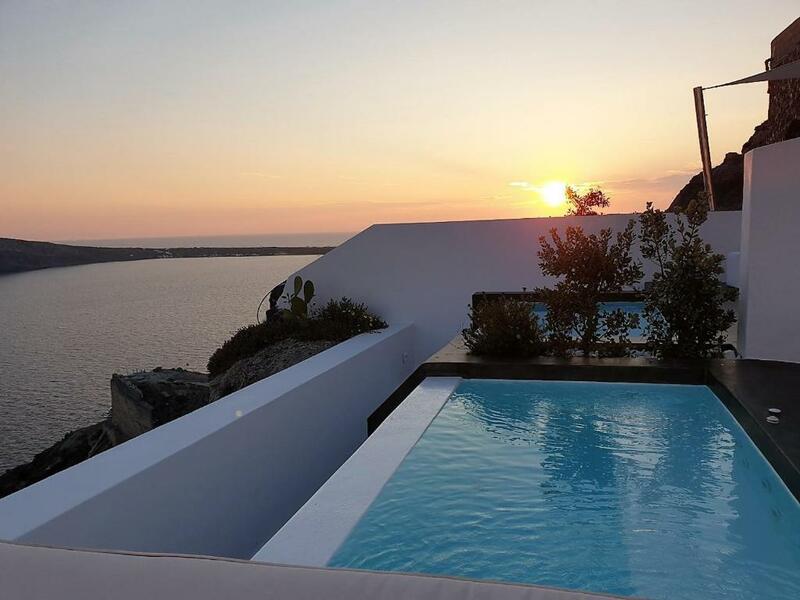 The hotel is the last set of cave villas on the mountain, so the sea and sunset views are stunning. The little cave villa was beautifully constructed, spotless, and peaceful. Not in the center of the tourist zone like other luxury hotels, so there are steps to climb, but there was much more privacy, and calm, romantic setting compared with other locations in Oia. Warm and low key staff and owner. We loved the six course breakfast to start the day, while watching the sunlight play on the rock formations of surrounding cliffs and nearby islands. Close to all the walking/hiking, dining, seaside, shopping (including Atlantis bookstore) and photo opps, and yet a world away watching swallows and enjoying mountaintop breezes in silence. I waited 40 years to see Greece and our stay was so perfectly close to what I had always imagined. So much appreciated! We had a wonderful time at Marizan Villas. 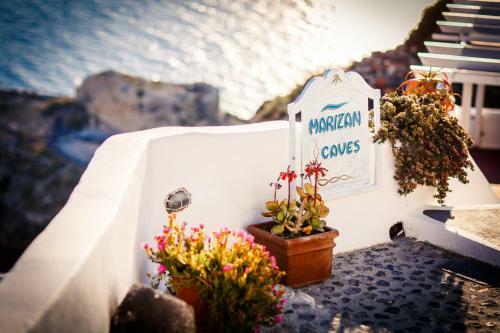 Of all of the cave hotels in Oia, Marizan is one of the best located for nightly sunrise viewing, and it also just beyond the tourist madness that is Oia in the summer. The Villas are family run and I can't say enough about how gracious, nice and helpful the management team is. I don't often provide feedback but I would feel guilty if I didn't in this case! Kostas was AMAZING! I had several questions prior to coming that he was very quick to respond to by email. He stayed late to check us in as our flight was delayed. He gave us WONDERFUL recs for food and activities. I cannot say enough wonderful things about him. Our stay was amazing! The view and proximity to everything in Oia made it so easy to see the most amazing things in Santorini. Will DEFINITELY stay again! Lock in a great price for Marizan Caves & Villas – rated 9.7 by recent guests! One of our top picks in Oia – and a guest favorite. Marizan Caves & Villas are in the highest spot of Oia, right at the edge of the famous Caldera (cliff), overlooking the sunset and the Aegean Sea from over 650 feet in altitude. Guests can relax on a sun lounge chair and enjoy the 4-person hot tub available. All Caves are on different levels, with balconies. Every Cave is a unique unit built in the rock, in line with the historic and traditional style of housing in Santorini. All Caves have a magnificent view of the volcano & the Caldera and come with TV, air conditioning, refrigerator & basic kitchen equipment. Facilities include breakfast and daily maid service. You can spend your day on the porch and enjoy the view and peacefulness of the scenery. The center of Oia with its elegant wine bars, restaurants and shops is just a 5 minute walk away. Guests may use the pool bar and swimming pool complex right next to the property. This property is also rated for the best value in Oia! Guests are getting more for their money when compared to other properties in this city. 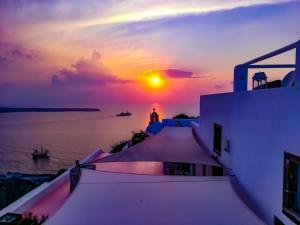 뀐 Located in the top-rated area in Oia, this property has an excellent location score of 9.8! When would you like to stay at Marizan Caves & Villas? Traditional cave-style room with unique caldera and sunset view. Combining traditional and modern architecture this cave-style room offers unique sunset views of the caldera from its private balcony. This cave house has a magnificent view to the volcano and the Caldera and comes with TV, air-conditioning, refrigerator and basic kitchen equipment. This villa has a magnificent view to the volcano and the Caldera and comes with TV, air-conditioning, refrigerator and basic kitchen equipment. This cave has a magnificent view to the volcano and the Caldera and comes with TV, air-conditioning, refrigerator and basic kitchen equipment. Featuring an outdoor hot tub, this cave room has a magnificent view to the volcano and the Caldera and comes with TV, air-conditioning, refrigerator and basic kitchen equipment. House Rules Marizan Caves & Villas takes special requests – add in the next step! All children under 12 years are charged EUR 60 per night for extra beds. Any additional older children or adults are charged EUR 70 per night for extra beds. Marizan Caves &amp; Villas accepts these cards and reserves the right to temporarily hold an amount prior to arrival. Marizan Caves & Villas accepts these cards and reserves the right to temporarily hold an amount prior to arrival. Please inform Marizan Caves & Villas of your expected arrival time in advance. You can use the Special Requests box when booking, or contact the property directly using the contact details in your confirmation. Good service. Amazing view. Clean room. the wifi wasn't really good. location, staff , service and the owner was v.nice to us. God bless u all! hope to see u again inshahAllah. The location is very good to see the sunset! It's a private area for the resistants, so there are no other tourists to bother. The public area are comfortable to have a relax. The room is large, comfortable and tidy. The service staff provided good service and were full of enthusiasm. And will help you with your luggage. Breakfast is served on the sofa outside the room, with an ocean view to enjoy. All in all, everything is so wonderful. 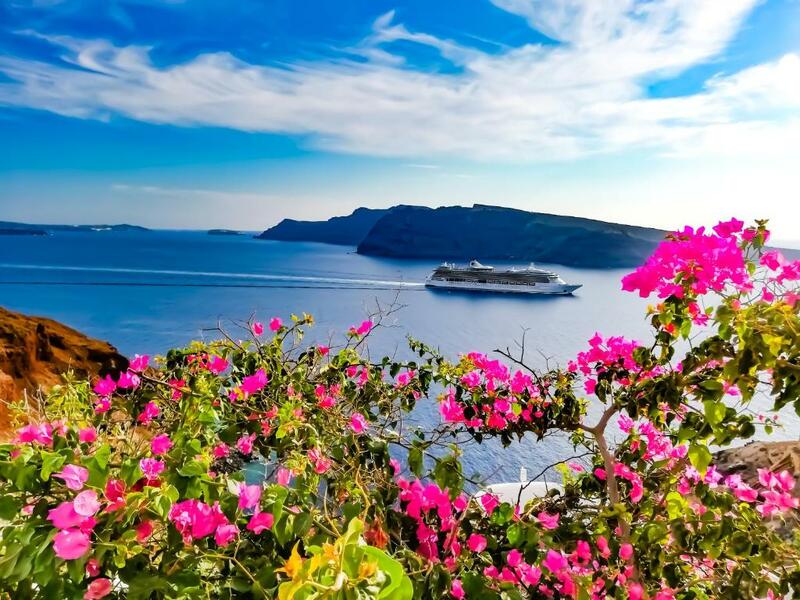 If I come to Santorini again, I will choose it again. And recommend it to my friends. Nothing. This place was perfect! Best stay in Santorini. Great and quite location with breathtaking sunset and landmark view, 2 mins walking to the main street, very high quality service and very nice breakfast, very helpful and professional staff, definitely worth to be back again. Excellent staff! Good breakfast and perfect location to see sunset!